In one way or the other, we’ve been in production for a dozen or so years, broken down into various production stages, such as tributes, festivals, interviews, transcripts, scenes, story boards, characters, backgrounds, layouts, and animation. In the Back Issues page you can find more detail about these various stages. However, during the last couple of months, all these areas of production have come to a halt, while our main production people have been working on this new website. In some ways that seems counter productive, but, this website will be used to try to bring in additional crew members, attract new donors, and perhaps go a long way to team up with a good distributor, as we hope to have the documentary finished within a year or so, depending on how much money we can raise, and new crew members we can bring aboard. When the website muscled its way into our production schedule, we were in the midst of three scenes, plus a number of others that we were about to start, all of which can be seen in our “Scenes” page, in the Production menu. So, once we finish the final touches to this web site we’re all going to pick up where we left off with these first twenty scenes. 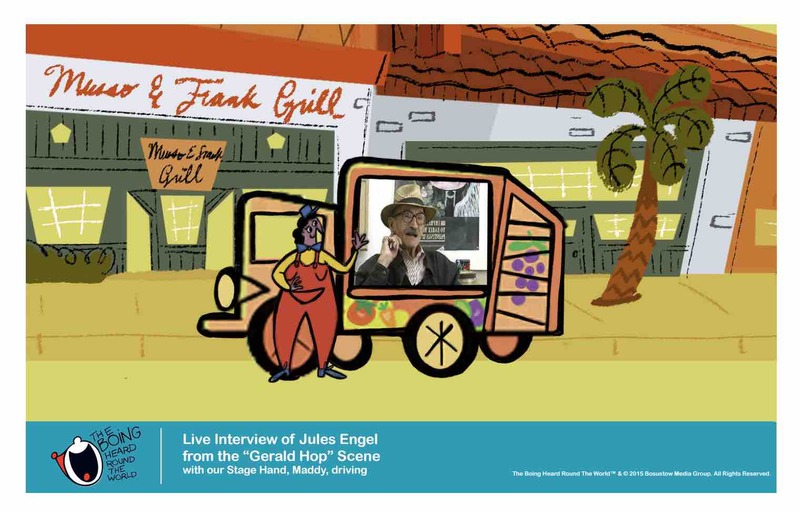 The Gerald Hop scene is the furthest along, a story recalled by Jules Engel on how Bobe Cannon came up with the little skip/hop that Gerald McBoing Boing does on his way to and from school. We were about to do layouts for the scene, when the website interrupted us, so, we will pick up with the layouts now, which will then be followed by animation, music, and effects. It’s an interesting scene, because we built Jules right into the animation itself. But, each scene will be different, designed to fit the story teller, and what’s being told. The second scene that we began about a month before the work on the website started, is Cartoonz is Cartoonz, completely different than the Gerald Hop scene. It’s a story Bill Melendez tells about how John Hubley didn’t want his films to look realistic, they’re cartoons after all. We picked a scene from one of Hub’s most famous shorts, and …. well, I don’t want to spoil it for you, just to say that the characters have been designed and the storyline has been set, so the next step for this one will be the first storyboards. The third scene is the Prologue, which is made up of several short scenes, some of which have been started. But, this scene we will probably not be share before the release of the doc. We want to share many of the scenes, but at the same time not give away everything, as we want to sell a few tickets, which we can’t do if everyone knows what the doc will be ahead of time. All this will be things to work will out in the coming months.